About "Tlb Living Bible Large Print Brown/Tan (Black Letter Edition)"
:Winner of the first ever quadruple Diamond award from ECPA! 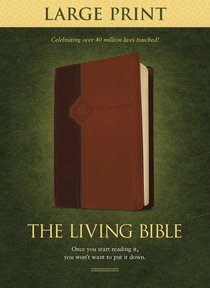 Celebrating over 40 years and over 40 million lives touched, Tyndale is releasing a new Large Print edition of The Living Bible. Features include a Bible reading plan, four-color maps, a topical concordance, and a presentation page. The uncluttered, two-column format and the large text make for easy reading.